Heat olive oil in a large skillet on medium-high heat. Add shallots and cook 5 to 7 minutes until caramelized, stirring frequently so shallots brown evenly. Remove from skillet and set aside on a plate. Place baby broccoli in pan and let cook 5 to 7 minutes until tender and edges are slightly brown. Toss with tongs every couple of minutes. 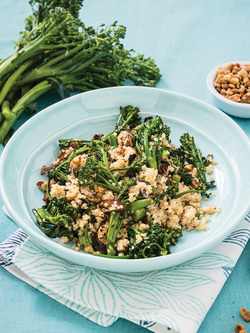 Add bulgur wheat and shallots to sweet baby broccoli. Toss together well and heat through about 2 minutes. Fold in walnuts. Season with salt and serve. For a little zing and added surprise, take a microplane to half of a lime and toss cauliflower in the zest just before serving. Carrots make a fine companion to cauliflower, too. Throw in a handful of 1-inch-thick cut (unpeeled) carrots—and a dash more of Sriracha—just before popping in the oven to roast. The added color and flavor will definitely impress your family or dinner guests.